“Home Sweet Home”. You like to travel, explore new places, and see new things, but you also love returning to the place, where you can hang your hat, when the adventure is over. Personalize this design with your family name and city, along with your latitude and longitude location. The colors on this pillow can be changed to match your decor. The best needlepoint pillows are the ones we hand stitch from 100% Waverly Wool or DMC cotton. You can choose from over 15 colors of velvet backing, and can opt to add piping around the edge of your needlepoint pillow. 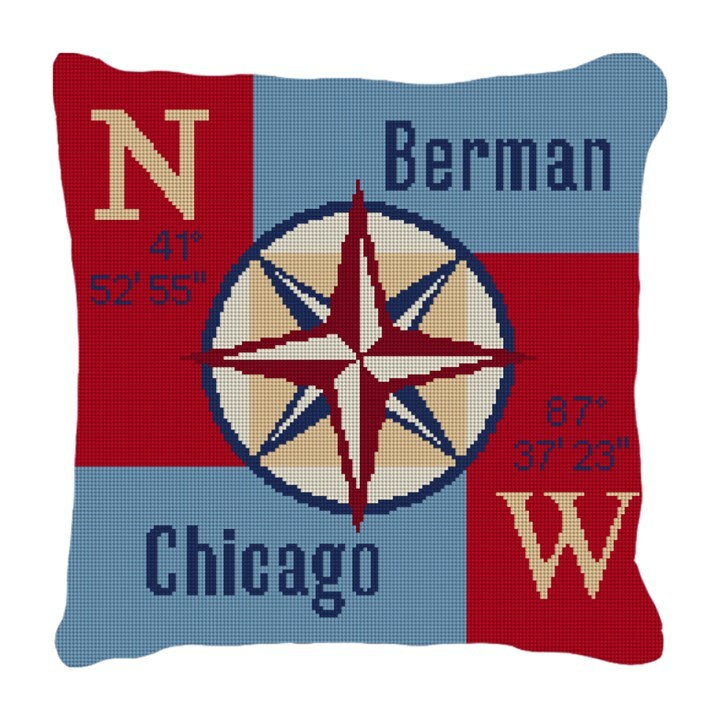 If you like, we can customize the needlepoint pillow with a name or change a design to use the colors that you desire. Every 12 x 12 inch and larger needlepoint pillow comes complete with a zipper in the back to remove the pillow form that it comes with. Our smaller needlepoint pillows are stuffed to size and sealed without the option to remove the stuffing. Our needlepoint pillows are made by hand, stitch by stitch, so they take 8 – 12 weeks to finish.